The CORONA 2.4GHz R4FA-SB Spread Spectrum FASST Compatible Receiver is designed for use with FUTABA’s FASST 2.4GHz transmitters; including the 3PM, 3PKS, 3VCS, 3GR, 4PK(S), TM7, TM8, TM10, TM14 and the T6EX-2.4G, 7C-2.4G, 8FG, 10CG, 12FG. The R4FA-SB receiver supplies a more useful mode for users. The R4FA-SB supports not only FUTABA’s FASST air system, but FASST surface systems as well. This receiver supports up to 7-channels with continuous PPM (positive and negative) output, RSSI output and S.BUS output. Under S.BUS output mode, R4FA-SB supplies 12 proportional channels and 2 DG channels. 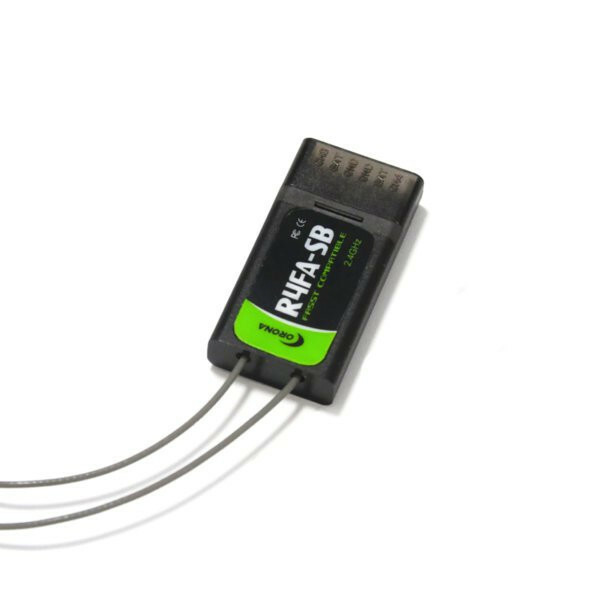 Therefore, the R4FA-SB becomes a 14-channel receiver when using S.BUS output.